Content marketing is awash with data and metric points. There are an overwhelming amount of content marketing metrics that we can track. Some are more important than others. Some are more or less relevant, depending on your marketing goals for the content you’re reporting on at a given time. It can be tough to know which ones are important to your marketing and which are simply ego boosting (vanity) metrics. We all like to find reassurance in our efforts and assumptions. I believe this is simply human nature, but if we want to strive we need to be more critical and seek out the content marketing metrics that matter the most. The phrase ‘quality trumps quantity’ might be a cliché, but it very much valid when it comes to your Facebook business page and it’s followers. Facebook reach is precious and growing ever scarce for businesses. To achieve reach on a post you rely on a snowball effect of user engagement. You see, when you post an update on a Facebook page, a sample of your audience will see it (the size of that sample can also vary, based on many factors). If those initial people engage with the post it has a far better chance of reaching more people. If there is no reaction, well then it’s a dud and unlikely to spread. The interesting thing is, once a post begins to get shared, or even liked and commented on – your page likes become somewhat irrelevant. The web has opened up beyond that group of people and your post is reaching new people. Those new people may even share the post too and it is quickly 2..3..4… people removed from that first fan. The thing is, that first fan was interested enough in your content to have shared it. If they weren’t, the post won’t have gone anywhere. That’s a quality page like. If you focus too much on the quantity of total ‘page likes’, well you may just dilute the quality fans who care enough to share your posts. That’s going to kill your page. The most important metric on social media is engagement. Are the people who do see your posts reacting to them? Are they sharing, commenting or clicking links? If your content isn’t engaging your audience in some way then it’s all just a big waste of time. All the page likes in the world are completely meaningless if nobody is noticing you. Engagement is the metric that matters. Sidenote: New page likes is a very positive thing. It’s a strong signal, but it should be earned based on relevant content. For example, a competition giving away a very mainstream prize will attract an untargeted audience or a page likes ad campaign whereby people like your page based off 2 lines of text and an image is not exactly proving a strong affinity with your brand. Will these people be interested in your next post? Racking up your page view numbers will make you feel good and you might impress certain people with those numbers, but does this grow your business? Is it a sign that your creating brand awareness? No and no. It might be a start, but we should be looking for quality first, not quantity. Very often we are driving traffic from sources such as social media, Adwords or SEO and people click, hit the page (a pageview) and spend no time on the website. So, while the pageviews are clocking up, we’re not necessarily getting any real engagement or actions being taken. So, you really ought to watch how much time is spent on your website as an indication of quality traffic and if people are actually taking the desired action, e.g. purchasing, signing up or making contact. Whether your website is built to sell products, gather leads or to build an audience on an email list (for example), your content marketing should have a goal – that’s what the “marketing” part is all about. So, be sure you monitor the conversion rates and that each piece of content is fulfilling its objective. Break it down into channels and see if you can increase activity on the ones that are performing best. You may even spot some winning tactics or ideas that are transferable across to other channels. But, at the end of the day, it’s conversions that matter the most to your business. There are over 200 Google ranking factors and people are obsessed with inbound links. There is a good reason for this because the right links to your website can help you rocket up the rankings. 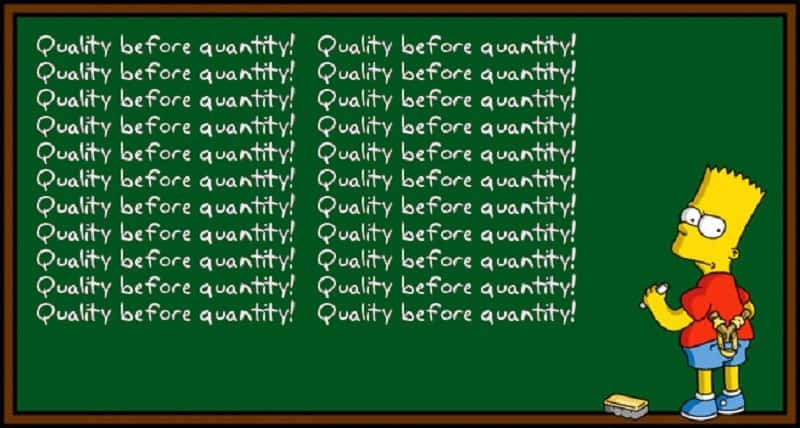 But, once again, it’s all about quality – not quantity (there’s a bit of theme running in this post). Not all links are created equal. You can easily build up links from low-quality websites or even create tons of blogs yourself just to send links to your website. This is no good. If you receive a link from a website that is somebodies hobby site and is not very well established, you won’t see much of an impact – if you get 1000 links like that – you may start to see some traction (note: you’ll probably get a Google penalty if those links are not natural). On the other hand, if you get a link from Harvard Business School you’ll definitely see the impact because that’s a very authoritative website and Google values a recommendation from them, more than it does a link from your buddies blog. In fact, a link from such a high-authority website is worth many (many, many) times more. With SEO, the bottom line metric is ‘clicks’. You can have all the best links, rankings and impressions – but if you don’t have clicks from the search engine results – it’s all meaningless. Of course, it should be the right users clicking and more than likely with Google it would be, such is their ranking systems. The ultimate goal is to get traffic from people who are searching for the content you have. Don’t forget this! On Facebook, our video views are counted after a 3-second view. What is that? A sneeze can last longer. This is no achievement for anybody. This is also the same on the Facebook-owned, Instagram. On YouTube, it’s more like 30 seconds before a view is counted. That’s better, except the average video length is somewhere between 4 and 5 minutes long. So, in that context, 30 seconds isn’t very much either, is it? 1 view more is a definite good sign, but it doesn’t indicate you have got a successful content marketing campaign on your hands just yet. If you have produced an 8-minute video it’s clear to see that there was little interest in the video if people are dropping off within the first minute. Your content marketing is not a success unless people are watching a good chunk of the videos. This is just common sense, but unfortunately, this metric is put in front our faces (and the public too) – so it’s no surprise we gravitate to this number. All the major video sharing platforms do offer up more insights into video viewing behaviour and demographics, so be sure to reference that as a default to understand how your marketing is going. There are plenty of metrics on the surface that make you feel like your making progress but just are not important. Map everything back to your business goals. When you track a metric, ask yourself how this relates to progress in your business – then you’ll be right on track.